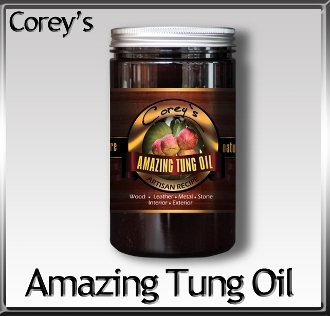 We are extremely proud to offer you Corey’s Amazing Tung Oil. Finally, a superb, non-toxic, non-flammable, sustainable finish with no breathing hazards. The secret is simple, we just use the best ingredients to begin with. We use over 50% pure Tung Oil, enhanced with organic Brazilian Gum Rosin and food grade Citrus Oil. This product has been designed and developed for professionals who demand exquisite results. You truly will be amazed.